Today I published my App for Logging and Log management. inspired by Simple Log I wanted logging standard with date - time in front of each message and some log management. It has an option to limit the size of the log and some action cards to clean or truncate the ever growing log. For example with the e-mail sender app it is possible to send emails with the complete log of the truncated part for archiving in email. Let me know if you like it or have any requests! Version 0.3.6 - 20180107 Published as Stable! - Automatic Adding & Removing Logging to All Flows with a Prefix. - Migrating Flows from Simple Log. Added api /log to Log something from fe HomeyScript. Converted Settings to two Objects & some Cleanup. Fixed "Report an issue" Link to Own GitHub. For any questions just comment here ! 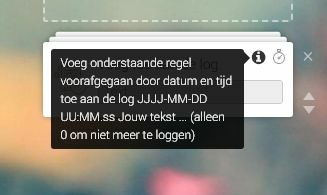 @GeurtDijker very nice, I was adding the date and Time tags manually to each SimpleLog card, this really helps. Also the possibility to send te Logs by email is a welcome improvement! Maybe you could add a way to push to set a alternative log location, like a database? Updated to 0.1.8 and as I think it is good enough published to stable also. If you upgrade from beta to stable I guess the only thing you could loose is your current log. With email.sender the next version (probably 0.1.6) you can email logs as text with only newlines \n as I use in PaperTrails so good readable. See the examples at the github wiki to get an idea how to use. If you have auto updating for the app you will update in the alpha/beta channel also to this latest 0.1.8 without losing anything. If you update manual you probably wil lose the current log and the settings max and append. Flows will still work after upgrading to a stable channel. First want to know if my SDK2 creation is working before I update it to stable . See the Wiki for how to use Logging from the AND column! Updated to Version 0.3.6 - 20180107 Published as Stable! (See Above) Getting everyone at SDKv2! Perhaps I am over looking this; I have my flows organised in folders. If Papertrails add's a card with the Flow name, I still have to find the corresponding folder. Is it possible to extend the option "Flow Management | Add to the log" with the flow name AND the flow folder name? But I get the point, I will look if I can implement it, should be possible. It can still take some time (weeks) but I like it. It would be 'nice to have', not 'need to have'. Found another small issue, but not sure if this is caused by your App, or the Homey beta Android App. If I use the beta Homey App, I can't clear the log. Pressing the button doesn't clear it. Is it possible to manually add a "Add to the Log" card to the ...Then Column of a flow? Or another method to log date/time and name of the flow to the log?